Hooves traced a familiar path up the narrow and winding walkway of earth amongst so much wind, fire, and water. So high up the gales were fierce and at times threatened to knock even one as sturdy as he off his precarious perch. Beside him blue fire sizzled and hissed as it scoured deeper amongst the rock work. Below the sea raged with white and blue armies against the monument of mountain. It was not familiar because he'd been here often, only once before in fact, and that encounter he least of all recalled the walkway. Rather it was a well worn trail that suggested many hooves over many sunsets and sunrises. That should have been proof enough that there was something worth believing in, yet Coris held his reservations in trusting too easily of this mare of the moon, much less the other gods. He'd believe it when he saw it, and so far he only saw a pretty strange mare having him do stranger things on her behalf, although he couldn't determine how she benefited - mostly he wanted to be stubborn and grumpy. When at last the volcano flattened out to a plateau, with three massive shrines taking up most of the foot room, Coris let out a sigh of exertion. His rib cage rose and fell, sweat beading up around his leather apparel, and his nose flaring. Gods certainly liked to be theatrical he thought with a grumble. Waiting a moment to gather his breath the smoky blue then approached the shrine of the Moon God. He glanced sideways at the bizarre thing for a moment, then in a clear, if hoarse voice, spoke to it. Not for the first time, he felt utterly foolish. "Oh mighty Moon Mare, here me now as you did before. I have returned with the deeds you asked. I make camp now in Mauja's herd, the Edge of the World, serving as his craftsmen, for you saw it fit to bless him with the unsavory glass makers." Coris snorted. "His acceptance of me speaks of finding me worthy, does it not? I could be even worthier, provided that which I seek from you." He was a horse of his word, at least, if a selfish, doubting, coarse horse. He would live forever in Helovia, and had no plans to abandon Mauja, who in time would only find his leatherwork more superior over glass. "Unsavory?" her voice, soft like lilac drifts on the wind of a shadow. A breeze lifts the stallions dark mane, and the queen materializes slowly like rain pouring from the sky, painting her body in lavender. One of her pupil's eyes was punctuated by a raised brow. "Few can master the art and beauty of glass, as my fiery brother is most oft involved in such things," she commented absently, turning her ornate features to look at the stallion curiously. A smirk turned her lips. "A worthy King you have chosen, you crafty creature. Well, I keep my promises." The goddess lifted her silvery maw to the sky and parted her lips. From her lungs came the sound of rain and thunder at once in the form of a song, and her pupil less eyes closed. A hawk's cry answered her song, and the falcon swept down, eyeing the strange unicorn curiously. It landed on Coris's head and seemed to know and understand who he belonged to now. "Be one of mind," she said, her voice leaving no room for argument. The words held power, and knit the two minds together. Whether or not Coris would listen was no longer her problem. Suddenly, she got the distinct feeling that she was no longer needed, but the Queen hovered anyway, observing her larger brother erupt from the ground like some kind of wild tree. With a shake of his mighty, dusty mane, the Earth God furrowed his brows, seeing his sister nearby. He offered her a smile with she returned kindly, and then he focused on the one before him. "You want something...?" he trailed, looking on expectantly. The God of the Moon did not keep Coris waiting long. In fact, she responded with such punctuality that it startled the simple craft-maker in such a way that his body grew taller, his muscles tensing over a hollowing back while a sole forehoof slid out a fraction, suggestion a reigned-in shy. His head snapped to the side at once, blinking lightly against the gentle wind that blew and played in his mane. He watched the mare assemble herself from stars and darkness, wind and rain, and not for the first time and perhaps not for the last, noted how lovely, how mysterious a being she was. All the same, he remained skeptical, as only a stubborn bull can before the display of so many truths. Her tones continued to lap against his ears like a lake crawling up and down its shore. Though she was not wholly chastising, there was a quality of a teacher looking down at a errant student when she spoke of her precious glass-maker. Coris said nothing, knowing he'd already pushed his luck too far with the first comment, but his mood towards the glaziers did not change. As if finding her humor, a smile danced upon the lavender mare's maw. Coris wondered idly just what was so funny about Mauja or his choosing of that spotted king; an inside joke perhaps. What came next however, had the stallion standing nearly on tip-toe in anticipation. When the goddess let slip a hauntingly beautiful and entirely strange song, an involuntary shudder passed through the dusky stallion. His breath hitched in his lungs and his heart rate sped up to a deafening point behind his ears. Every sense he had on hoof was straining to catch... what? He did not know what he was looking for, what he was waiting for, only that something would come, something must come. Coris quivered with an internal roil of new emotions, namely hope, bubbling up inside him. His logic was slowly losing the fight against his longing, the belief in this unbelievable being driving him toward a new place of spirituality and self-acceptance. Could it be that she was true and honest and she could, and was about to make him more whole than he had ever been since birth? The excitement of all it left him reeling and he had a niggling sensation he'd be exhausted after this encounter despite little exertion from him part. Coris caught the sharp cry of a descending falcon, his eyes soon tracing the dark shape whirling through the skies from a place unknown and unfathomable to the mortal beast. Its wings, such glorious wings, buffeted the air as it landed with a practiced ease upon his poll. The talons, such lovely talons!, dug gingerly into his scalp causing the skin to prickle with an odd mixture of pain and pleasure. Again his body trembled, overwhelmed with the mass of sensations pounding against his nerves, as if his entire self was being unwound and rewound over and over again. Was he being reborn? It felt perhaps he was, if he could remember what the first birth was like. Tears dotted the golden eyes that had softened to butter. A wide smile cracked his solemn features. Laughter, such a strange sound from him surely, rung from his chest with a guttural ring. He could not speak, could not think, he could only feel and it was great. The bird's mind felt like a warm touch enveloping his mind and coating his heart. He could feel the second conscience beating like a small heart in the base of his thoughts, full of only color and emotion. Gratitude over came the beast. Knees hit the ground with a hard echo. His nose slid over the dirt, making a line. The falcon, Venati, fluttered as its balance was lost and gave a cry of indignation as it took to the skies. Dust billowed around Coris' nose as he exhaled sharply, an attempt at self-composure. "Thank you, Goddess of the Moon. Thank you with all my heart and soul," he breathed, eyes eventually lifting to stare up at the celestial creature. They shone, wet still with tears of joy, the light in them speaking of love. A call from Venati sharpened his focus, features turning up from the dust to realize the Earth God was looking at him with a well-versed patience. Hot with embarrassment, considering where his thoughts had just drifted, Coris scrambled to his hooves. That seemed invitation enough for Venati to return, so he settled quickly on Cori's backside, talons gripping his leather adornments rather than flesh this time, as the stallion cleared his throat and found his voice. "Y-yes God of the Earth. Though the Moon has given me much already," Coris smiled, ears tilting kindly towards the falcon on his back. "I am still lacking the true ability of my kind. I've studied the leather work of my lineage, and the falcon's talons and beak with be immeasurable assistance to aid what my hooves cannot, but I know more resides within me. I can feel as those I have it, the gift to work leather by magic, but I cannot seem to access it. It has brought me great grief and gave my dam and sire embarrassment." He paused, wondering if gods cared about such trivial matters. It had been much easier last time when he didn't much believe in the Goddess of the Moon, but not he felt entirely foolish and humbled in a new way that left him stuttering and dumb before their regality. Venati picked at his mane with a strong beak, and that touch sparkled renewed confidence in the wayward stallion. "I cannot truly serve my king and my herd if I am not capable of the one thing I know. I wish to share my craft, to improve and aid these lands in as much so as I am capable." 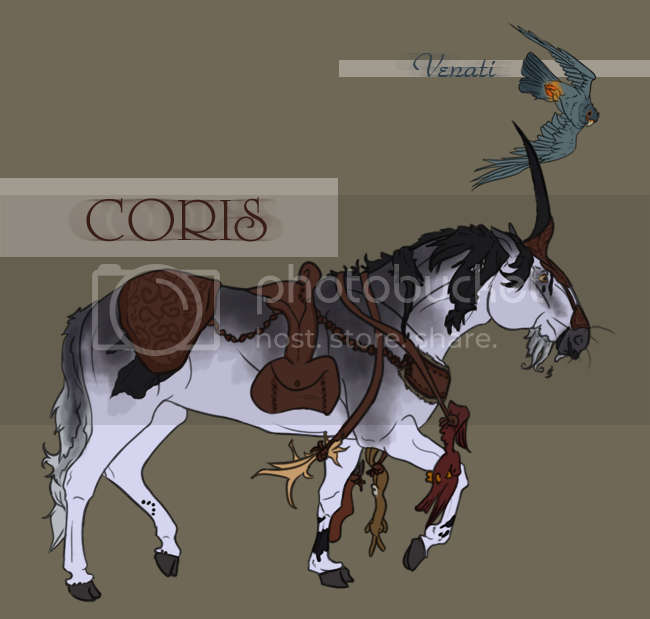 It was true, Coris being a proud craftsman wished to offer his trade to the horses here. Of course he was also inspired by a selfish reason, in that he wanted to be able to craft, truly craft - his rudimentary work without the magic was an unwanted heap of spoiled leather. Yet at its very core, even a selfish craft horse was a giving one, because they made their work to provide for the absence of others. The Earth God weighed his request with deeply furrowed brows and a heavy sigh. Even though his desire was rather selfish, the nature of a crafter was quite useful to others. He leveled his emerald gaze at the unicorn and spoke like rumbling thunder. "In order to create and work with leather, you must kill. To give you this gift, you must first understand the importance of life and the sacrifice that is made for your craft," he spoke seriously, not an ounce of humor in his expression. "You are now bonded to a living creature, so you must befriend three other companions and their bonded mate whose hide you would possibly use to create your leather goods." The Earth God paused in order to gauge his reaction. "Once you have met and befriended them, invite them here so that I may meet them as well." Like Lotus's Cat, something sort of earth bound and non-mythical. :) Pyr, maybe. The companion's hide. Unlike the gentle, soothing sensation that the God of the Moon's voice instilled in Coris, this god spoke with such a stern ferocity that it shook into the very core of his bones. Coris wondered just how differently he would have felt if the Earth God had been his first impression. Would he have believed immediately, or at least been more fearful of improper manners? Coris thought for a moment, deciding the God of the Earth was certainly more intimidating just in sheer size and tone of voice. The leatherworker knew though that if it wasn't for the honesty and blessings of the Moon leading him to respect the gods currently, no matter who he saw first he wouldn't have believed until it was square in his face. The Earth God began in a clear, sensible fashion. Coris could understand where the ideology of the God's thoughts were going, and for a moment the stallion was petrified with the belief he'd be tasked with creating new life in the womb of a mare, a truly unsightly deed. Yet on further listening, he wasn't sure if he might prefer that over the provided task - to make friends. Coris couldn't quite believe that the God of the Earth had spoken and not his dam so many years ago, shooing him out of the forest and forcing him to play with others. He made a face of disgust, his face creased with a frown. He could certainly meet those with companions, but befriending them was a whole different body to skin. This would be a long while until he was back here. He sighed. His hopes settling in the pit of his stomach. He did nothing but oblige however with a weak nod. "As you ask, God of the Earth," he murmured.